A collection of more than seven hundred international vegetarian recipes based on Ayurvedic principles and practices explains how to enchance the immune system, prevent disease, and promote health and healing with a wide range of vegetarian specialties. 12,000 first printing. Tour. For twenty years Miriam Kasin Hospodar traveled between three continents, gathering recipes inspired by the age-old Eastern wisdom of Ayurveda. 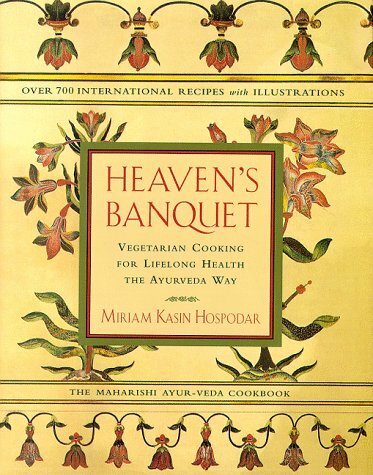 "Heaven's Banquet" is the remarkable result of her culinary journey, a definitive sourcebook of healthful and delicious vegetarian cooking. In more than 700 recipes and variations, "Heaven's Banquet" draws from a rich palette of international cuisines and shows how to match your diet to your mind-body type for maximum health and well-being. Using recipes that have been tested in places ranging from a five-star Swiss hotel kitchen to a charcoal-filled pit in the Philippines, Hospodar brings us such exotic dishes as Thai Corn Fritters, Asian-Cajun Eggplant Gumbo, Persian-Style Millet with Dried Cherries, Moussaka, Scottish Shortbread, West African Avocado Mousse, and Mocha-Spice Cake with Coffee Cream Frosting. Her recipes will appeal to everyone from the beginning cook to the experienced chef. But "Heaven's Banquet" is more than a cookbook. It is an invaluable guide to a holistic lifestyle that will enhance your entire life as it balances your mind, soul, and body. You'll discover the most effective methods of preparing food, the benefits of eating seasonally for your type, and how to create a diet tailored to your entire family. A special feature of "Heaven's Banquet" is its dessert section, which features egg-free cakes, cookies and puddings. There are also special sections on how to lose weight and control sugar sensitivity, a detailed questionnaire to help you determine your mind-body type, and essential ingredients for a well-stocked Ayurvedic kitchen. 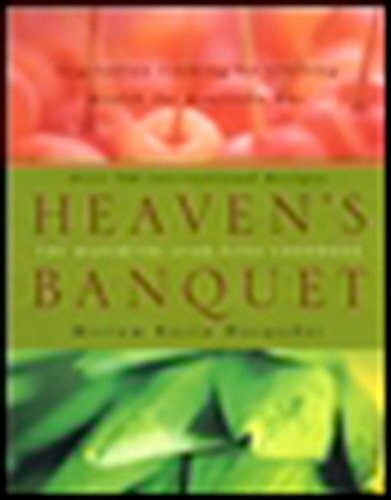 Timeless and timely, "Heaven's Banquet" shows you how to use food to tap into your body's intelligence to create lifelong health. Miriam Kasin Hospodar has received extensive training in Ayurvedic cooking and healthcare, and has worked as a chef at Ayurvedic spas in the United States, Switzerland, France, the Philippines, India, and Taiwan. A certified teacher of the Transcendental Meditation program, she lives in Santa Barbara, California.